The Style Me Bloggers are back today with a great topic - I Like Big Books And I Cannot Lie: My Reading List Recommends. Reading has always been a passion of mine, and I've tried to pass on that love to my sons. Today I thought I'd share some of my boys' favorite books - I've read them all and enjoyed them too! When C and T reached the teen years, it got harder to find challenging books that were age appropriate. We definitely had some trial and error. You can't go wrong with the Harry Potter series and The Hobbit. But then what? Unbroken. The true story of Louis Zamperini, a young Olympic athlete who enlisted as an airman when World War II began. When his bomber crashed into the Pacific Ocean, Zamperini had to use all of his resilience and spirit to survive. This is T's favorite book he's read yet. To Kill A Mockingbird. Obviously a classic, and still a must read for any teenager, especially given the latest racial tension our country is experiencing. The Absolutely True Diary of A Part Time Indian. A native boy leaves his troubled school on the Spokane Indian Reservation to attend an all-white farm town high school, where he hopes to break away from his "predestined" life. So, so good. The Book Thief. Set in Germany during World War II, the story follows a foster girl who discovers books for the first time. The Princess Bride. As good as the movie is, the book is even better. This modern fantasy classic is a simple but exceptional story about revenge, true love, and never giving up on what you want. The Sisterhood Of The Traveling Pants. Nope, my boys weren't interested in reading this series, but they're perfect for a teenage girl. C received two books as gifts for his high school graduation that are going to come in handy when he moves out next year. Life After School. Explained. and Where's Mom Now That I Need Her are both great how-to's for navigating financial issues, laundry, grocery shopping, insurance, and lots more. Finally, I can't end this post without a shout out to the most popular book from my teen years: Forever by Judy Blume. This book about "first love" was a favorite among all my friends in high school. I can't remember who bought it first, but we passed it around, hiding it under our mattresses so our parents wouldn't find it. Ah....memories! Be sure to check out the other Style Me Bloggers to get their book recommends, and link up with us below. I'm excited to find some new titles for my spring reading list! As I was writing this I realized that most of them have been made into movies! The movie is one of my favorites, but the book is so good too! I have the movie Unbroken at home, I need to watch it. I loved the movie the Sisterhood of the Traveling Pants! I totally forgot how much I love The Princess Bride. 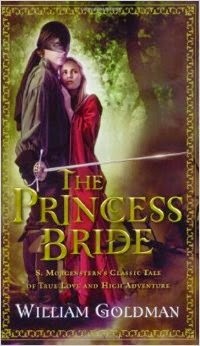 I'm participating in a Princess Bride craft swap on Instagram, so I need to re-read that book! I also loved Judy Blume books in school. They were always checked out from the school library! We have Unbroken at home, but my fella has dibs on it first! I loved every Judy Blume book. Love reading YA novels!! I have all the Sisterhood books and have The Book Thie but haven't read it yet!! Have to get Unbroken!! I really like YA novels too! Wow- such a different list for those boys...not anything I'd seen in my classroom. I think my high schoolers were all sci-fi/fantasy lovers. Although, there are some interesting series out that made for good discussion. Have they read the UnWind series? No, but I will suggest it to them. I don't know why they haven't read more sci fi. Right now they have so much "school" reading that they don't do much for fun. Of these I've read The Book Thief and The Sisterhood of the TP. Loved both. My go to folks for books are my son and my mom. Both read voraciously and can always suggest something that I'll enjoy. It was my son who told me about the Book Thief. He was a huge Eragon fan. Did your boys get into that? Just started Goldfinch but seem to have only downloaded the first chapter! My younger son liked the Eragon books. I always get lots of suggestions from my dad! I have heard many good things about Unbroken. Sadly since I am not an avid reader, I will probably watch the movie. The movie was excellent too! So many good suggestions here Lana! My kids both have loved books from an early age. I don't have a book post to link up right now, but if I get my "I Mustache You Some Questions" post done this week, I will have four recommendations in that! My kids, of course, both read the Eargon Series - Christopher Paolini, from Montana was 15 years old when he began to write the series! I didn't know the Eragon author was from Montana, or only 15 years old when he started writing! How cool is that! My younger son loves the zombie genre! I will suggest Jerry Spinelli to them. Yay, YOU, for mentioning and loving Forever by Judy Blume. I used to read some of the juiciest parts of that book aloud to my high school students each year then have a waiting list for the book all semester long. Such a great book. Good for you to have read so often with your boys. I would love to read Forever again! We have Unbroken on the Nook and I definitely want to read it. The Book Thief...wasn't that made into a movie recently? I love almost anything WWII so I'll be putting that one my list. Hope you're having a great weekend. Thanks Carrie. Yes, I think The Book Thief was recently a movie. Happy weekend to you too! I love the Book Thief it is one of my all-time favorite books! I was actually going to suggest it to you! I have To Kill A Mockingbird and Unbroken on my hold list at the library and lord the times we've read Harry Potter and seen the movies! I am a book addict! Me too - another thing we have in common! These are great suggestions! My daughter has read some of them but now I add a few to recommend to her! Thanks for sharing! I'm sure you have some great suggestions too!